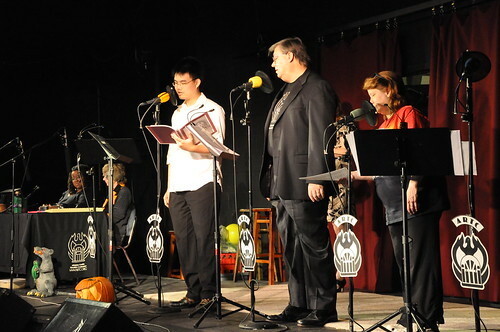 This week we bring you our appearance at the Academy Theatre in Avondale Estates, which featured our 2009 performance of The Call of C’thulhu by H. P. Lovecraft, adapted for audio by Ron N. Butler. Check out all the pictures on our Flickr album. We’ve performed a lot of different places over the years. Hotel ballrooms. High school auditoriums. Hair salons. 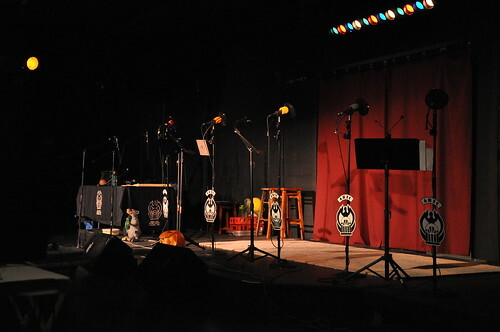 But one of our favorites from an acoustic point of view was the Avondale Estates location for the Academy Theatre. Not too big, not too small, well lit, walls made of hard concrete. Well, maybe that last part wasn’t so great, but you can’t have everything. 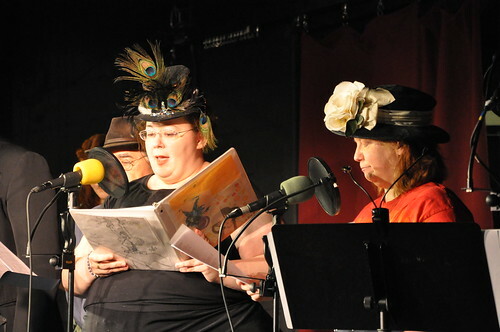 At our 2009 performance, not only did we bring everyone the cosmic horror that is Lovecraft’s The Call of C’thulhu, we also brought Brian Phillips’s original audio drama Night Call and Kelley S. Ceccato’s The Worst Good Woman in the World! There’s really only one harmonica player here. But in audio, who can tell? 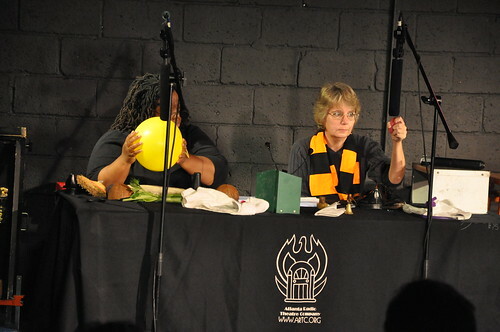 Tammie Hood and Clair W. Kiernan. Hats? What hats? We’ve talked before about how we don’t often do costumes, but every so often we just can’t help ourselves. High tech Foley. Squishiness comes at a price. Auditions for Lovecraft pieces sometimes consist of just a bunch of screaming. Be sure to check out our performance calendar to see when you can see us next!